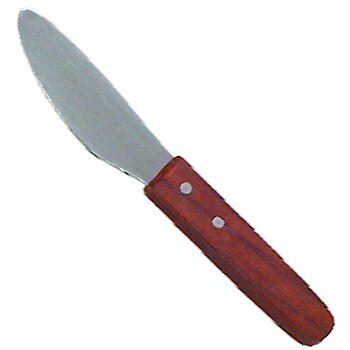 The large wood handle fits comfortably in any sized hand. making it ideal for anyone, especially users with the use of only one hand! The stainless blade is 4.25 inches long and 1.25 wide at its widest point. The wood handle is 4.5 inches long x 1 inch wide x .5 inch deep. Dishwasher cleaning is not recommended due to the wooden handle.